Shell and tube is the most advanced technology available and is specifically engineered for particular applications. 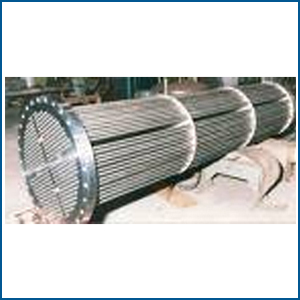 Heat exchangers are commonly used for the transfer of heat in industrial process applications. They are available in a variety of diameters and lengths. The U-tube heat exchangers are designed for a wide range of liquid to liquid and steam to liquid applications. The shell and tube heat exchanger is constructed using copper tubes and a carbon steel shell. It is manufactured using tide range of applications. • Removable tube bundles for convenience in cleaning and inspection. • Coil and baffle arrangements designed to maximize heat transfer performance. • Hydraulic and lube oil cooling. It is the most common type of heat exchanger in oil refineries and other large chemical processes, and is suited for higher-pressure applications. As its name implies, this type of heat exchanger consists of a shell (a large pressure vessel) with a bundle of tubes inside it. One fluid runs through the tubes, and another fluid flows over the tubes (through the shell) to transfer heat between the two fluids. The set of tubes is called a tube bundle, and may be composed by several types of tubes: plain, longitudinally finned, and other types.